The maximum diameter over bed of the standard version is to 335 mm / 13,19 inch. To be able to fully exploit the swing over bed an additional outer bed can be obtained which is screwed in front of the bench bed. With this the maximum diameter with long grain turning will not be disturbed by the bottom of the tool rest and the locking lever. 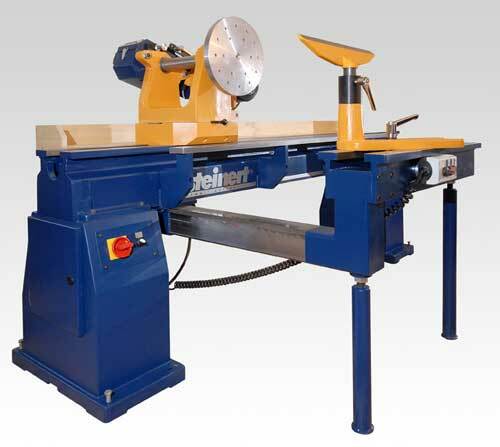 Furthermore the tool rest obtains stability which is impossible to gain with common constructions due to the necessary overhang of this tool rest. A major swing over bed can be realised as spezial request. With this a closed cast iron headstock is deployed. 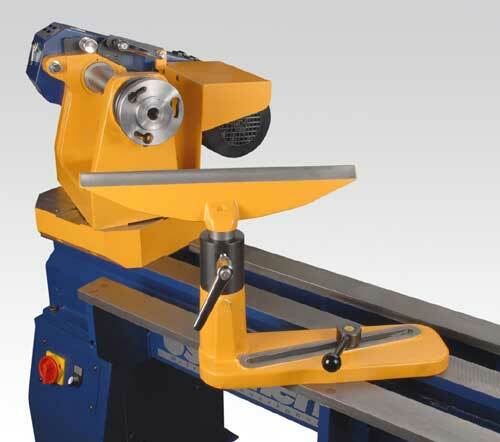 With rotating the headstock 90° and using the optional outer turning device it is possible to reach rotation diameter of 2000 mm / 78,74 inches. The machines’ distance between centres amounts to 1500 mm and is extendable to 3850 mm / 151,57 inches or 6200 mm / 244,09 inches. The spindle is bored through with a diameter of 18 mm / 0,71 inches.